If you are looking for a great gift for a birthday or housewarming or anytime, I recommend this book! I've spent several hours reviewing PEACE, LOVE and BARBECUE by Mike Mills and Amy Mills Tunnicliffe. Just the chapter on the "Secrets" would be worth the price of the book. Additionally, the "Magic Dust" recipe will leave you wanting to run to the store and make up a batch just to shake directly on your tongue! The book just isn't a "recipe" or "cook book", it's all about what people think and do for the love of food and not limited to barbecue either. This book will set you straight on many "urban legends" and point your smoker the right direction in how to smoke a lip smacking brisket. Loaded with nostalgic photos and neatly put together, I just can't say enough about the whole book. Probably one of the first books I've read and associated the titles three words! Click on the AMAZON link to get your copy smokin' fast! 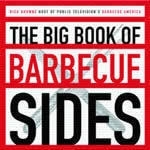 The best barbqeque companion book was just published! A glossy cover with explicit how to do instructions on some very tasty looking recipes! There is a guide printed with each recipe telling how the dish will appeal, i.e. "succulent" for the BUTTER FLIED TURKEY to "savory" on the PORK TENDERLOIN with RED CURRENT SAUCE. Tastefully put together loaded with glossy photos of the actual recipe prepared. 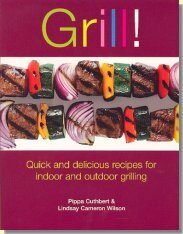 This book will be at home both on the coffee table AND the grilling table!